It looked as if India’s plan to power up the country using coal would be a disaster for the environment. But renewables changed the game: they currently make up 20% of the energy mix and are growing fast. L. Michael Buchsbaum explains. Illustrative of India’s economic miracle, just this spring, its last village without access to electricity was finally connected to the energy grid. But to fuel this growth, beginning in 2010 India rapidly initiated development of almost 1,000 gigawatts (GW) of new coal-fired energy. With the fifth largest domestic coal reserves worldwide, and Australian and Chinese mines eager to supply immediate demand, India’s economic miracle seemed like game over for the health of planet Earth. But nearly simultaneous to their swift coal build up, India also began developing green energy. Though only 20% of the current energy mix, roughly 70 GW of renewable capacity has been installed and at least another 40 GW is under construction according to the latest government data. With around 11,788 megawatts (MW) more being added between April 2017 and March 2018, India is now positioned 4th globally in wind, and 6thin solar. Additionally, last year the renewable energy sector created 47,000 new jobs while sustaining almost 400,000 more positions, according to the International Renewable Energy Agency (IRENA). The sheer pace of India’s adoption of renewables has reduced aggregate installation and production costs by 50% over the last two years according to Bloomberg New Energy Finance (BNEF), flipping earlier economic projections and torpedoing plans for hundreds of megawatts of new coal power. Though coal still supplied 80% of the economy last year, new wind and solar is now 20% cheaper than existing coal-fired generation’s average wholesale power price. Moreover, rising domestic production costs, the doubling of imported coal prices and a crippling delivery shortage continues to plague the industry. Currently new renewable energy is less expensive to build than it costs to run most of the existing coal fired power in the nation—let alone construct new plants. Case in point: in June the state owned utility, NTPC, the largest owner and developer of coal plants in India, cancelled its planned 4 GW Pudimadaka “Ultra Mega” Power Plant project in the state of Andhra Pradesh. No longer economical, according to the Institute for Energy Economics and Financial Analysis (IEEFA), since the 2010 build out announcement, India’s coal plant pipeline has shrunk by 547 GW. To put that into perspective, that figure amounts to almost three times Germany’s total installed capacity. And while 80 GW of new coal-fired capacity is still technically “progressing” through myriad approval processes, IEEFA estimates that no more than 10-20 GW might actually see the light of day. “That means more than 84% of India’s 2010 coal pipeline will have been cancelled when all is said and done,” said Tim Buckley, IEEFA’s Director of Energy Finance Studies, Australasia. Moreover, under the nation’s 2018 National Energy Plan (NEP), India’s Central Electricity Authority (CEA) has recently proposed closing nearly 50 GW of inefficient and heavily polluting coal capacity by 2027. Retrofitting those that remain open to achieve new compliance standards will cost millions more, forcing operators to reconsider future investments as renewables elbow them out. So how will India keep both the existing lights on and enable millions more citizens to power up? The new NEP calls for an incredible 275 GW of total renewable energy capacity by 2027. In June the trajectory for the build-out was increased to no less than 227 GW by 2022. At these rates, clean energy is projected by BNEF to constitute 75% of total capacity by 2050, essentially inverting the status quo. Illustrative of this leap forward, on June 21, India’s Ministry of New and Renewable Energy (MNRE) R.K. Singh announced a 100GW solar tender, with an emphasis on battery storage and domestic solar manufacturing. This announcement follows on the heels of plans for 8-10GW of annual onshore wind installations, plus an ambitious 30GW of offshore wind by 2030. Under the Paris Climate agreement, India had already committed to produce 40% of its installed electricity capacity from non-fossil fuel sources by 2030. Singh has since vowed to have over 55% installed by then. While an enormous task, a large portion of the support and financing for this is coming from Japan’s richest man, SoftBank founder Masayoshi Son, who has reportedly told Indian Prime Minister Narendra Modi that he will underwrite most of the 100GW of new solar with a US$60-100 billion investment. But can this and the overall 275 GW target realistically be met on time? While not sure if the giant solar tender “makes a lot of sense”, IEEF director Buckley, offered instead that the plan is indeed a “brilliant statement of intent.” Certainly, by setting the aspirational goal, India has attracted investors and further spurred the development of their domestic manufacturing industry. Tulsi Tanti, chairman and managing director of the Suzlon Group, one of the nation’s leading wind energy suppliers, expects that there will be at least two million workers employed in the wind energy manufacturing industries by 2022. 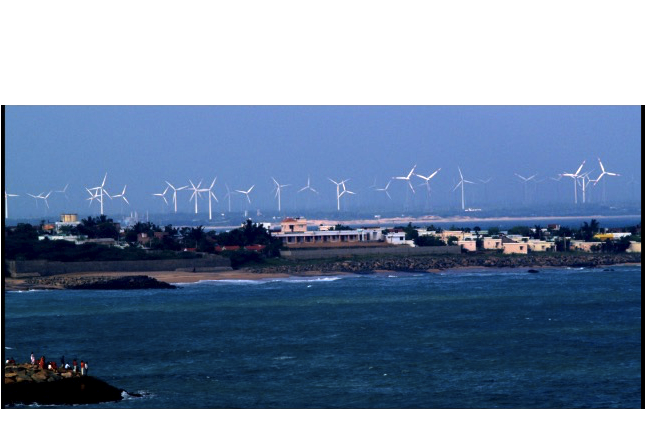 Suzlon currently commands a 35% share of the market since over 8,500 of their turbines with a cumulative generation capacity of 11,919 MW power it. “In the next financial year, a minimum of 1 GW more [of wind energy] installation will happen every month,” Tanti said as the nation ramps towards 50-60MW of total wind capacity.